SEPTEMBER brings us a new term with new beginnings and also the famous last night of the proms with its hugely popular programme when the audience loves to join in. I have much enjoyed some of this year’s proms through the BBC TV broadcasts, often appreciating the concerts more through the warm and skilful introductions of Charles Hazelwood. One concert was indeed unforgettable. Conducted by Sir John Eliot Gardiner, it included a suite of French dance music by Rameau. What was amazing was not only the stunning orchestral performance by the English Baroque soloists and the Buskaid Soweto String Ensemble but also the beautifully choreographed dancing by a troupe of young people from Europe and Africa. They had energy and grace, movement and stillness, colour and simplicity. The music and dance was truly creative: bringing together vivid contrasts which too often we keep apart and falsify by turning into opposites. It celebrated the wonder of our humanity at its best and most gifted. I was given another pointer to the creativity of the human spirit at the final concert of this year’s Three Choirs Festival at Gloucester – an amazing performance of Mahler’s colossal 8th Symphony. The opening words Mahler chose to set to music – Veni Creator Spiritus – underline the true source of all human creativity. The latin hymn – Come, Creator Spirit – celebrates the unending variety which is available to every human being inspired by God the Holy Spirit. Mahler’s music is breathtaking. He celebrates what some people call The Life-force. Christians prefer to think deeper and with better definition. The Lord and Giver of Life is God the Holy Spirit. Life, colour and energy are to be the themes of this month’s parish weekend at Sidmouth. During our time away, we shall put to use the interplay between the many gifts our Christian family has received so richly and generously. We will draw on skills in art, craft, drama, discussion, music, reflection, sport, team-building and share them with one another. Each one is God-given and powerfully creative. We use them with a strange combination of reticence and exuberance, humility and uninhibited delight. This is the unique mixture which the Holy Spirit gives to all who are open to receive his gift of Life. In one of his recent Thoughts for the Day, Rabbi Lionel Blue said ‘As God is in you, to know him better you need to know yourself better too.’ That remark hides a demanding and risky challenge. Getting to know ourselves better is always full of surprises and can often be painful. But taking Time Out and using it creatively to know one another and ourselves better is also an opportunity to receive and renew the wonderful gift of Life which is in every person. Congratulations to William, Bethany and Sarah, Chloe and Dylan, Rhiannon, Amelia and Caleb, Louis, Jack, David and Nathan, who all made their First Communions in June or July. We hope to run more preparation classes in the autumn; please speak to Fr Michael if your children might be interested. In September we will begin preparation for confirmation at a service to be held in the Cathedral on 24 November. If you would like to be included in the preparation, or would like to find out more about what confirmation means, please speak to Fr Michael. Fact or fiction? Myth or fable? The Bible Study Group will meet fortnightly in September and October to try to find an answer. You are welcome to join us in All Saints’ Church for these four evenings, even if you have never been before. The first session is on Tuesday 11th September. We start at 7pm; coffee is available from 6.45pm. On Sunday 24th June the Reverend Jon Morgan was inducted as a Minister in the United Reformed Church of Cheltenham. We welcome him to Prestbury and All Saints’ and look forward to meeting him at ecumenical services. WELL, there haven’t been many times over the past four years when I’ve been lost for words! But I have to confess that I found myself quite choked up as the thought of leaving Prestbury and All Saints’ finally started to hit me for real at the wonderful ‘leaving do’ that you’d organised for us. As Dr Seuss says ‘The sun did not shine, it was too wet to play…’ but there was no giving in, people moved their picnics inside and joined us in the school hall for a lovely afternoon. (Who’d have thought we’d all get home to find there was no water?!) With some great worship led by the Celebrate! band, kind words from Fr Michael that made me blush from ear to ear, a procession of presents we thought would never end and so many good friends to share it all with, it really was a special day for Christine, Bethany, Sarah and myself. Thank you so much for the wonderful presents, I don’t know what we’ll do with the cheque yet – it was very generous indeed of you all – but I already have the perfect place in mind in our new house for the Rublev icon of the Trinity and I shall also treasure the lovely card of Pittville Park that so many of you signed with such kind words. The girls are more excited than most of you can possibly imagine at the thought of their very own swing in the garden and, after battling it into the car, Chris is looking forward to settling her new plant in the conservatory(!) at Grange Road. Above all though, thank you so much for making us all so welcome over the past four years. Coming from outside the area, not knowing anyone and constantly disappearing from church to church, it would have been possible to feel like perpetual strangers. But thanks to you, that did not happen and instead we have had the joy of getting to know three very different church communities along with the schools, youth groups, TEMPO and so much else. It’s been a real joy working here and I’ve felt particularly blessed in all the people I’ve worked with but especially Fr Michael, Fr Stephen and Andy Macauly, from whom I’ve learned an enormous amount. I hope you know how lucky you are to have had them and that you make the most of the exciting opportunities ahead as the North Cheltenham Team evolves. We’re looking forward to life in Cambridge and at St John’s. Chris’ eyes are already glinting with the thought of all those choirs and the musical possibilities. But it will be hard to leave, and St Nicolas’, St Mary’s and All Saints’ will always have a special place in our hearts. On three Sundays during the year we take the opportunity to join together for worship with our brothers and sisters from St Mary’s, St Nicolas’ and All Saints’. We aim to do this on or near to the Patronal Festival of each of our churches. I would encourage you to make that extra little effort to attend these services; it is a wonderful experience to worship with a larger number of people occasionally. It reminds us that we are part of a wider church family and also makes a statement about our desire for fellowship and unity within the Body of Christ. On Sunday 9th September at 11.00am there will be a Team-wide Sung Eucharist in St Mary’s, to which you are all warmly invited. 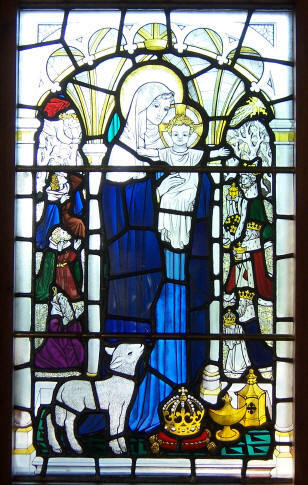 St Mary’s celebrate their Patronal Festival on the Feast of the Birthday of the Blessed Virgin Mary (8th September). On this Sunday there will be an 8am Eucharist in all three churches but there will not be a service at 9.30am in St Nicolas’ or at 10.30am in All Saints’. Please speak to one of the Wardens if you would like transport to St Mary’s. Do you have pre-school children and would like to meet new friends? Then come along to Rockers on Thursday afternoons at St Mary’s Church from 2-2.45pm (term time only). Our first meeting this term is on Thursday 13th September. Rockers offers children a relaxed atmosphere to introduce them to the Church, by singing action songs, listening to a short bible story, encouraging them to take part in a creative activity or play with toys. There is also an opportunity for the adults to enjoy a cup of tea and a chat. Fun and friendly, please come along. For information please contact Vicky Dunn or Lisa Roberts or email rockers@prestbury.net. St Mary’s Church will be participating in the national Heritage Open Days in conjunction with The Civic Trust and English Heritage. The church will be ‘on show’ for visitors from 1pm to 5pm daily from Thursday 6th September to Sunday 9th September, coinciding with St Mary’s Patronal Festival. We will be showing a short film entitled Travels Through Time, the story of Prestbury, using first-hand accounts of life from the 13th to 20th century. Teas will also be available in church on those afternoons. This is being advertised on the Heritage Open Days website hods@civictrust.org.uk and www.heritageopendays.org. On Saturday 22nd September at 7.30pm in St Mary’s church Christine McKelvey will give a concert of piano music to include works by Bach, Mozart, Beethoven, Brahms, Mendelssohn and others. Admission is by ticket, on sale in advance and at the door. Please see leaflets or pewsheets for details. Further concerts will be on Saturday 13th October 7.30pm with The St Cecilia Singers, to include works by Britten and Parry, and on Wednesday 7th November at 11am with Peter Greaves, the current organist at St Mary’s. In June, Prestbury and Pittville Youth advertised for a new half-time Youth Inclusion Worker on www.glosjobs.co.uk. Over 100 people clicked the advertisement, 10 asked for the application pack, 3 applied, 2 were interviewed and Sharon Carley-Macauly was appointed to start work on 1 September. She has a wealth of relevant experience and qualifications and has worked for PPY as a volunteer for several years. The Executive Committee are delighted to welcome her now as an employee. She will be working on Wednesdays and Thursdays with ‘Pittville Youth Action Group’, young people from Pittville School who are not engaging with the mainstream school curriculum and who are at serious risk of being permanently excluded from school. Under Sharon’s guidance, they will follow an alternative curriculum which will ensure that at the end of two years they have ASDAN qualifications which will open doors for them into jobs, training or college courses in a similar way to GCSEs. No this isn’t early warning of next year’s event! As we haven’t had a magazine since the fete on June 30th it was felt that you might like to know how things went on the day. With hindsight we now realise the weather wasn’t too bad! Thanks to David’s marquees the games all took place outdoors, with the coconut-shy and beat-the-goalie attracting crowds despite occasional downpours, whilst Daphne and Allan whipped up enthusiasm for the Doggy Gymkhana. Indoors, sales of ice-cream were slow, but Marle Hill WI produced a mouth-watering display of cakes for the much-in-demand tea stall. Visitors were able to browse and buy at all the traditional stalls and observe the work of Glevum Scribes, who also provided the certificates for the winning dogs. Many thanks are due in both sides of the parish to people who helped in planning, collecting, persuading(! ), and in tidying everything away at the end. Thanks to Lindsey for accommodating a herd of white elephants in her garage until they were passed on to Swindon Village for their fete and to Tony Mason for delivering all the surplus books to the charity shops. Saturday 14th July saw 60+ children and 30 adults converge upon St Nicolas’ for another activity packed day. The children were introduced to the aim of the day and quickly put into their groups where they met their leaders. The groups then participated in a variety of workshops that linked directly to a Parable, ranging from the ever popular clay to collage and banner making and creating gardens in seed trays. The day closed with an act of worship which was supported by many in our congregations. This was a team wide event and it was good to share in the day with our friends from the wider North Cheltenham Team. A huge thank you to all those who helped to make the day so successful. On Friday 13th July Andy and Sharon Macauly hosted an awards night – suits and ties for the players, pretty dresses for wives, mothers and girlfriends. Special thanks were made to Andy Macauly and Grant Bayliss for all they had contributed to the inauguration of the NCC team, and many other awards were presented by team captain, Tim Rudge. The new season kicks off on Saturday 8th September at 10.30am with a league match against Ecclesiastical FC at King George V playing field. On September 22nd NCC play Gloucester Community Churches at Plock Court. Do come and support these matches if you can. Full details of the 2007-2008 fixtures are on the website www.prestbury.net. Every five years we are required to ask our architect to carry out an internal and external inspection of the church. The report we have received has highlighted work that in the opinion of the architect needs to be carried out in order to maintain the building in the best condition possible. We have received quotations from three contractors and completed the faculty application process. Detailed below is an outline of the work to be carried out with estimated costings. This gives a total estimated bill of over £22,000! The PCC has agreed that we must go ahead with the work. However, this will drain most of our financial reserves and so we must address the issue of fundraising so that those reserves can be replenished. If you would like to make a donation towards the work, please use a gift aid envelope and clearly mark it ‘St Mary’s Fabric’. IT IS 6AM. The telephone rings. 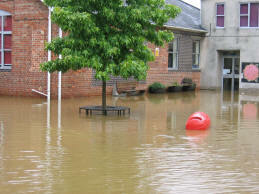 ‘The school is flooded,’ says our vigilant caretaker. Our emergency contact system springs into action: parents at work make provision for childcare; county services are informed. Staff are soon on the spot to see the school and playground submerged. Water streams from the overflowing culvert, blocked with the debris brought down from the hill in the torrential rain. It flows through the school and the overflow continues its way through the backdoor and out the front of the neighbouring cottages. Parents delivering their children to the Infant School stare in disbelief at the damage and offer help and support. Time for action. In the classrooms, staff start to retrieve vulnerable low lying items. Thankfully much is in deep plastic boxes. They stack furniture, as they wade through the water (photograph left). The culvert is unblocked, revealing such items as a man’s jacket, a large tin can, bottles and debris. The rubbish fills the back of a truck. Slowly the water level subsides, as we locate manhole covers and unblock drains. Camaraderie is great. We climb on the council lorry, shovelling sand and making sandbags ready for another possible attack. County services work until 10pm pumping out the water; dehumidifiers arrive; the school is decontaminated. After a week’s closure the school is reopened. 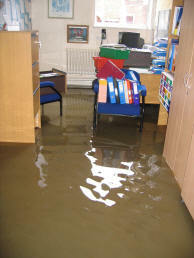 A county official said that ours had been the worst case of flooding in a school that he had seen. Sadly we have to replace our recently laid carpets and much of our new furniture. 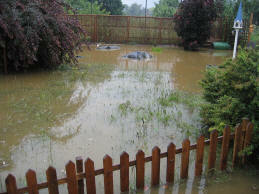 The pond in the school conservation area (photograph right) is submerged. Armed with pond dipping nets, we begin our quest to rescue countless newts and tadpoles. Thanks go to those many people who offered practical help, sustained the staff with cakes and sandwiches and generally helped morale. Exceptional rainfall now makes us very nervous. We monitor the culvert like hawks. Please help us in this task and report any blockages further up the stream. One flooding is enough! Daphne’s account is of the events of Monday June 25th. Less than a month later, on Friday July 20th, there was far more rain, and although the school did not flood again, there was widespread flooding in many areas of Gloucestershire, including Prestbury. on those whose homes are spoilt, whose livelihood is threatened. pray a blessing on all who rescue and relieve. And, when the floods have gone, guide us to learn lessons. reverence for a creation you have made to be very good. Our theme was ‘Going Green’ and we started the evening with a photo shoot by the Echo and then our opening ceremony. We talked about the ten golden rules of friendship, sang ‘Make new friends’, talked about the 3R’s, sang the ‘rapping robot song’ and talked about our carbon footprints and how to reduce them. RECYCLE:- To build a robot made out of things that could be recycled. REUSE:- To make a ‘piggy’ money box out of an old milk carton. We all then joined together to sew a ‘sleepover bag’ and to colour in a bookmark or two ready to give out in church. (We had a competition before to design it.) Out came our beds, and so did the midnight feasts!! (These were made up of a compost heap – with worms, tooth brushes and teeth!!) Finally after watching the Horrid Henry DVD the Brownies decided that some sleep would be good!! Sunday morning arrived sooner than the Guiders would like but we were all up packed away and ready for breakfast at 8am. We gathered outside church and sang as the congregation arrived. We started the service with the tooth brushing challenge; we were joined by Father Grant, the Sunday club and a few brave adults!! The service was based around our ‘Going Green’ theme and the Brownies were given a very active part. All the Brownies enjoyed the service although a few were spotted with eyes closed!! After the service we finished with our Thank you’s, certificates, prizes and goodie bags!!! IT WAS in the Guide Headquarters, Deer Park, Cowley. It was my second Brownie pack holiday, this time Piglet was leading, she was taking her pack holiday test. I was very excited. We needed to take clothes, a sleeping bag or duvet, pillow, potato peeler and T towel. The theme for the pack holiday was ‘Under the Sea’. We made mermaid tiaras out of tissue paper and glitter, fish finger puppets (!! ), we sewed felt purses and decorated them with sequins and made a mermaid mobile. We made biscuits for our party and played pin the tail on the mermaid. At the party we did a cat walk showing all our crafts that we could wear. The highlight of my pack holiday was doing archery. My score was 87 points which included bulls eyes! Badger was the chef, my favourite meal of pack holiday was spaghetti Bolognese. The puddings were yummy especially the lemon meringue pie. I had a wonderful weekend – thank you Piglet and guiders! Can’t wait for the next one!!!!!! THESE OPENING WORDS of Sunday’s Evening Prayer took on a whole new meaning as I sat reading them on the deck of the ship in bright sunshine – at a quarter past midnight! For nearly a week we had not seen any darkness: even before we crossed the Arctic Circle the sun was setting in the north and rising again in the north shortly afterwards, the sky remaining bright and light all night. It was mid-June and our cruise was six days on one of the Norwegian Coastal Express boats, which delivers goods for supermarkets and is used by the locals as a passenger and car ferry from one port to the next as well as being a floating hotel for tourists such as us. We called at over thirty ports, many of them small villages, some of them during the night, and often for only twenty minutes or so. Others, such as Trondheim and Tromsø, were much larger and we stayed longer. We joined the ship at Bergen on a Tuesday evening, and even there my comment at midnight was ‘daylight outside; sky is lightest due north.’ Next day saw us, after a brief stop at Ålesund, dwarfed by the steep sides of the spectacular Geiranger Fjord. At the far end we were transferred by small ferry to the waiting coaches for a day in the mountains. Up the Eagle Road – talk about hairpin bends! But once up there it was a different world: villages and fertile valleys, strawberry farms and snow – yes, not only was last winter’s snow still lying, but it actually snowed on us! More hairpin bends down the Trollstieg, across two more fjords by ferry, and we finally rejoined the ship at Molde in the evening. Thursday’s excursion in Trondheim was a complete contrast. First we visited the great grey Nidaros Cathedral with its green roof and beautiful pink marble floor. 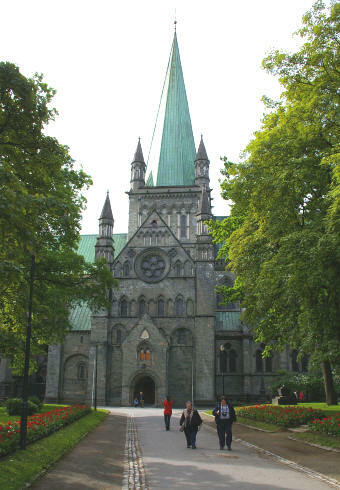 This is an English cathedral built by English stonemasons – Saint Olav had discovered Christianity in England, loved our cathedrals, and wanted one! By the way, his symbol is an axe: being a Viking, his method of evangelism was to behead you if you didn’t convert! After the cathedral we spent a happy hour or so at the Ringve Museum looking at and hearing many old musical instruments. between pretty islands and eventually rejoined the ship at 2.30, through the car deck again, at Bodø. Day and night being indistinguishable, I slept for a couple of hours that afternoon while we crossed relatively open sea to the Lofoten Islands. We were able to go ashore briefly at a couple of places, visiting an ice gallery – many figures all carved out of ice, including the bar, the seats and the drinks glasses – and then were wide awake for the Troll Party on deck at midnight, with drinks and soup as the ship turned round on the spot in the narrow dead-end bowl of the sheer-sided Troll Fjord. 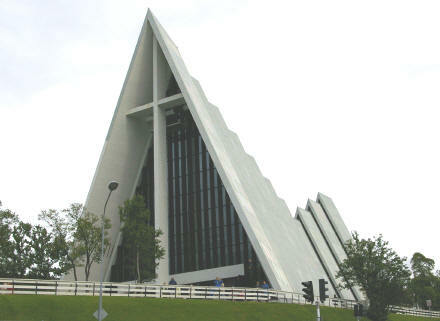 Saturday was another city excursion, in Tromsø, and included the Tromsdalen Church, or ‘Arctic Cathedral’. Constructed from great slabs of concrete in a series of different sized triangles with glass in the gaps between them, the whole cathedral resembles the tip of an iceberg. Perhaps that is what all our churches should be – the visible part of a community immersed in God. Sunday saw us out in the wilds again, by coach through the mountains to a small fishing village and then out to sea on a bird safari – thousands of birds, including puffins and sea eagles. That night we and many others stayed up, hoping the sun would come out from behind the clouds. We were rewarded shortly after midnight and by half past twelve it was brilliant, just hanging there, neither rising nor setting. At 1am, as we stood watching pallets of goods being unloaded at a small village, the sun was already higher and was warm on our faces. This was what we had come for, and was well worth staying awake for. What enabled Peter to come out with such a definite statement? Imagine the scene! Seated with his friends, Jesus looks around expectantly and asks, ‘Who do people say I am?’. No doubt they look from one to another, each wondering, ‘Should we tell Him?’, ‘What if we say the wrong thing?’. Then someone dares to speak. Others follow. Finally, it is Simon Peter who responds to the direct question, ‘Who do you say that I am?’. For him, as for each of us, the time has come to speak up for what he believes, no matter what other people might be saying. Peter is responding to what he has learned from miracles and teaching, and Jesus is using tactics familiar to many lecturers. If asked a question, He answers with another. Little by little, He leads the enquirer gently forward to search more deeply, uncovering the truth bit by bit. At the beginning of Matthew’s Gospel, gifts laid at the manger point to the significance of the infant Jesus. Gold for a King; incense for a God. In the horrid account of the king’s birthday, with the Baptist’s head on a plate (Matthew 14:1 12), we can compare Herod’s kingship with the Kingship revealed in Jesus. At his baptism, and in Peter’s words at Caesarea Philippi, we see Jesus acknowledged as Son of God. Peter recognises the Divinity of Christ the King, revealed in the miraculous transformation of the ordinary, but his experience and understanding are still incomplete. If he limits his perception of Jesus to what he has learned so far, he might well come to the wrong conclusions. For the Magi brought another gift, with darker undertones – myrrh pointing to suffering and death, the inescapable counterparts of Kingship and Divinity in the Kingdom revealed by Jesus. Peter’s Keys of the Kingdom will be the teachings and example of Jesus’ whole life, his living, dying and rising. Only by continuing to the end of the story will we (and Peter) be able to appreciate it completely. Begin our celebratory weekend with a lively evening! This year we shall celebrate Harvest at St Mary’s and St Nicolas’ on Sunday 30th September, the same day as the Consecration of St Nicolas’. Please see the pewsheets nearer the time for details of decorating the churches and the type of gifts to bring. Prestbury and Pittville Youth would like to develop their ‘flexible seating’ – if you have any cushions you would be willing to donate please contact Andy Macauly. Following the success of the Our Voice Film Premiere, Prestbury & Pittville Youth are preparing for their ‘Alternative Fashion Show’ on the evening of 10th November at St Nicolas’. Please do book out that evening to join us to share in this gala event, help raise money for PPY and awareness of issues around fashion. The next bakestall at St Mary’s is on Sunday 16 September with contributions from those with surnames N-Z. Please contact one of us if you would like to join the rota. Despite the water problems, we had a lovely garden party in July at Tatchley House. Our thanks go to Bob and Barbara for their hospitality. This month’s meeting is on Tuesday 25th September at 7.30pm in the United Reformed Church, Deep Street, and will be a Beadwork Demonstration by Ruth Moore. You are very welcome to join us even if you are not a member of the MU. Tea/coffee and cakes on Friday 21st September from 11am to 6pm at Limber Hill, Wyman’s Brook. Do come – everyone very welcome. We are all invited to as world-wide tea time event to help those in the world’s poorest communities work their way out of poverty, and for St Mary’s end of Prestbury Bob and Barbara Lyle have kindly offered us the use of their garden. Come and join us for a cup of Fairtrade tea and special cake on Friday 21st September at 4pm. Donations can be gift aided to Christian Aid. Saturday 8th September is the date for this year’s sponsored ride/walk in aid of the Trust. If you would like to participate and require details about this event then please contact Bob Lyle, Brian Wood or Nigel Woodcock. A Practical Study Morning led by Bishop Michael on Saturday 29th September. Please contact John Moles or Margaret and Colin Holman for details.